A bit of background on me: my name is Maggie Weighner, and I am entering my final year of studies in Ball State University’s Landscape Architecture program. 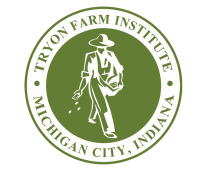 This summer, I chose to intern with Tryon Farm Institute for ten weeks. I’m interested in ecology and land stewardship, the design of food-producing landscapes, and working with non-profit organizations, so this was the perfect opportunity to explore those interests further! Plus, I certainly didn’t mind spending summer on such a beautiful property and being just a mile away from Lake Michigan! My very first assignment at Tryon Farm was to design a new map and brochure for residents, visitors, and marketing purposes that put the focus on lands and trails managed by TFI. Up until then, all the existing maps had emphasized the housing settlements and largely ignored the diversity of natural landscapes surrounding them. This project introduced me to Tryon Farm and allowed me to get to know it immediately. I spent multiple mornings and afternoons trekking around the property (on trails and off) with my geo-tracking app on, taking photos and making observations along the way. During this time I also became acquainted with the human community at Tryon, learning about each settlement, the intricate differences between land ownership, and the relationship of all of these spaces as a whole. After a few full days of walking around the property, I began testing out ways to graphically express all of the information one would want when exploring Tryon Farm’s trails, and went through many revisions leading up to the final product. Below, the map, key, and information on the various ecologies at Tryon Farm are excerpted from the trifold I designed. My primary project this summer was to re-envision Tryon Farm’s current community garden. For several years I have been curious about this area of design and have had some experience in it already, but I was happy for the chance to take on and lead such a project! Ownership of the land the garden sits on is soon being transferred from the Noonans to TFI, and so the growing list of improvements to be made found their opportunity to be expressed in a new plan developed this summer. Although the site itself is fairly small, there were innumerable issues and elements to be addressed, and that felt overwhelming at first. Right away, I made a project management plan – a schedule of what I would do and when over six or seven weeks – which I had never done before. So you can easily follow along with the timeline and process of this project, I will (roughly) group my work into phases. The first thing to do was to become familiarized with the site – its history, its present, and its potential future. I began by going out to the garden daily (and at different times of day) to make observations, take down measurements, learn what areas could be built on and what had to stay, and to basically determine the “good and the bad” of the garden as it is now. Scott helped in the developing of a program, both in expressing straightforward requirements such as an access drive, to more complex concerns such as how to treat thresholds and boundaries so as to identify the space as TFI’s, but welcome to all. At the same time, I was getting to know the social context surrounding the garden: In my opinion, this was a much more complex process than analyzing the physical site! Initially I spoke with individual residents at Tryon Farm, as well as a few gardeners in the Michigan City community in hopes of forming connections for the future. From these conversations and my earlier work with Scott, I developed a short survey to send out to the entire Tryon Farm community, for both gardeners and non-gardeners. Although opinions indeed varied widely, a few striking realizations resulted. One, nearly everyone replied that they value the garden most not for growing produce, but for its value in the community as the primary gathering space for social events and interactions of all scales. Two, for whatever reason, people expressed more openly in the survey their “big ideas” than they did in real life. Rather than immediately jumping to cost concerns, the community was excited for this chance to put forth a new vision for the garden, which made my job easier and more fun! Although I looked at dozens of garden designs and operational models throughout this process, I chose to compile just three projects into set of “case studies” to share with Tryon Farm residents. Each was similar in size to the site here at Tryon, but they reside all over the world and have very different aesthetics & purposes. Setting aside the constraints of the site one is working with to explore what others have done always encourages greater creativity! The last phase before giving a “mid-project” update to the community was to develop some basic “bubble” diagrams of how various spaces and uses could best be programmed onto the site and related to one another. I used seven categories of space: Gathering, garden beds, vehicle access, path/circulation, open space, orchard/other plantings, and playscape. This stage was more difficult than I thought it would be, not because I couldn’t think of anything, but because the possibilities were endless – and this made it hard to determine which made the most sense and held potential for the most interesting design. This stage of developing schematic designs from loose, conceptual plans was definitely the longest, as I went through several different concepts and revisions of each. A benefit of being so close to the site during the entire span of the project was that I was able to go out to the garden every time I had a new plan or idea and walk it out to imagine being in that space. Even more so than sketching everything, this was very effective because I was putting myself into the scale and the constraints of the site, while also slowly “erasing” some of what I saw as I built a new vision for the garden. About midway through this phase, I had a review with Scott, which changed pretty dramatically the direction this was going. At first I felt frustrated that I had “wasted time” on other ideas, but his suggestions opened up an entirely new path of schematic development, and everything just came together after that into a much more refined, elegant, and interesting plan. At last, I was ready to prepare the garden design for presentation to Tryon Farm residents. I spent three or four days working incessantly to produce final drawings, choose materials and plant species, and work out things like fencing details… And I enjoyed these fast-paced days! It felt great to finally be confident enough in the design to make it come to life. Identity and Purpose: One of the main goals or “motives” behind this design was to shift the garden’s perceived identity as a part of the Farmstead to a part of the barnyard (which TFI will also own soon). Thus, the reason for the name: This is the “yard” in barnyard, an outdoor place for community and socializing. The hope is to make the garden more inclusive of the public and able to support larger and more varied events. Access: A gravel access drive winds down through the site to the boat barn (which will be used for storage), defining the East edge of the space. The main entrances are now off of this drive, and lead into the central patio and pavilion. The original Farmstead entrances remain, but are deemphasized with material choice. Gathering Space: Before, the garden beds were tightly and inconsistently spaced, with no room for gathering in the actual garden – tables were placed around the perimeter. Now, there is a large central gathering space and pavilion around which the garden and other site elements revolve. Scales of Space: Another key aspect to note is the creation of spaces of many scales and types within the site. There is the central paved space, of course…but there are also areas of lawn created by the angling of paths and edges; intimate seating areas tucked into the fenced gardens; clusterings of blossom trees under which to walk; and a place for creative play under the much-loved treeline. In designing the garden it was important to keep in mind that as few as one or two people may come to garden or talk, or as many as 100 for the Farm breakfast. Garden beds: Most are proposed to be just a few inches above ground, with an area of beds 2.5′ high for the elderly and disabled (and to dramatize the main entrance). Ideally, most of the beds will be in-ground, with just a small wood edging to define them. This way, gardeners can use and amend the native soils, retain moisture better, and use watering systems such as drip irrigation. Fencing: one of the most prevalent complaints in the survey results was about deer eating produce. There are many ways to design deerproof fencing, but the proposed design (see below) was the most efficient in minimizing material and space taken up, and in maximizing visibility for humans. Gates: All of the gates are sliding so that they can be left open during gatherings for ease of movement and connection of spaces (see detail below). Play: The space under the treeline on the South is one of the most used currently, and I wanted to continue to give it purpose. A play space is proposed to go under the treeline, and to use the trees as a part of structure-building. The flexibility of this space is fun for the user, and also can be completely removed during larger events such as the farm breakfast (see detail below). The presentation went incredibly well, and I am very thankful to those who were able to attend and contribute to the constructive and positive discussion we had! I’m excited to see what will become of the garden and how these new plans might take life! I happily spent my last day at Tryon tying knots to trees, stakes, and other ropes to build an installation on the island in the West Pond. The concept began simply as “tent-building,” and we chose the location to “replace” the bird blind that recently fell down. It’s amazing how much an idea can evolve in 24 hours based on time and material constraints. At first I wanted to construct a wooden A-frame, then thought I might put up fencing and weave flowers through it, and ended up using only rope and some stakes. I learned several new knots – I didn’t really know any to begin with – and improvised the rest. Plus, this material was wonderful to work with because big design decisions and small adjustments could easily be made in the field. The best part about this installation is that it can be added to (this is just what we were able to accomplish in five hours). And I hope to come back this year to do just that! But for now, please make a visit out to the island – before a deer runs into the netting – and let me know your reactions and ideas for improvement. I look forward to visiting Tryon again soon.